Bennett, Karen & Rita Queiroz de Barros (éds.). Identity, Mobility and Language Change. Routledge, collection "Advances in Translation and Interpreting Studies", 2019. EAN13 : 9781138307407 — 230p. 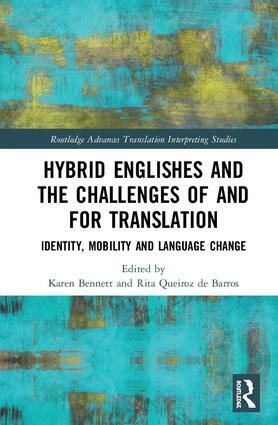 Introduction: Translation in a multilingual world: Reflecting Hybridity. 1. The Problematics and Performance of Self-Translation. The Case of Xiaolu Guo. 2. Translating las mestizas: from Anzaldúa's nos/otras to Moraga's labios. 3. Translating identities and politics in Arab Hip Hop. 4. Multilingual Reader, Translingual Reading. Unmaking the Anglonormativity of World Literature in Amitav Ghosh’s Sea of Poppies. 5. Heterolingualism, Translation and the (In)articulation of Grief in Portuguese-American Literature. 6. "I Have Taken Ownership of English": Translating hybridity in Chimamanda Ngozi Adichie’s Transcultural Writing. 7. Hybridising English, Hybridising French: Robert Dickson’s Translation of Tomson Highway’s Kiss of the Fur Queen. 8. Coco and the Case of the Disappearing Spanglish. Negotiating Code-Switching in the English and Spanish Versions of Disney and Pixar’s Animated Film. 9. Translating Hybrid Languages Ethically. Power Language Ambivalence in l’Últim Patriarca, by Najat El Hachmi. Cristina Carrasco (University of Salamanca, Spain). 10. Legacies of Translation: A Case Study of the English Lexis, Spanish Loanwords and Don Quixote Translations as Evidenced by the Oxford English Dictionary. Conclusion: The Veiled Guest: Translation, Hospitality and the Limits of Hybridisation.